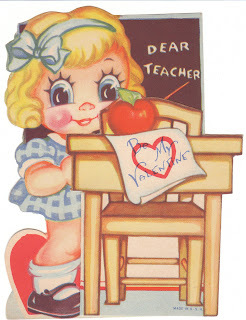 These school theme vintage Valentine cards are so cute! Some feature teachers, some are for a special teacher, some have school books, and others show a classroom. I remember buying packs of Valentines as a little girl, and finding one or two special ones for teacher in each pack. 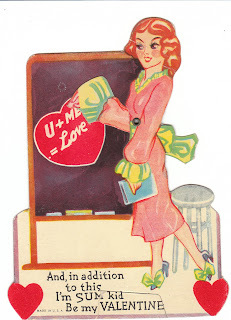 You'll find my school themed Valentines here: school Valentines at Birdhouse Books. I have a few school related Valentines to share with you. On this card, a pretty teacher writes on the blackboard: ""U + Me = Love." This card is 1930's to 1940's vintage. A big-eyed girl has an apple for teacher. This card is also 1930's to 1940's vintage. 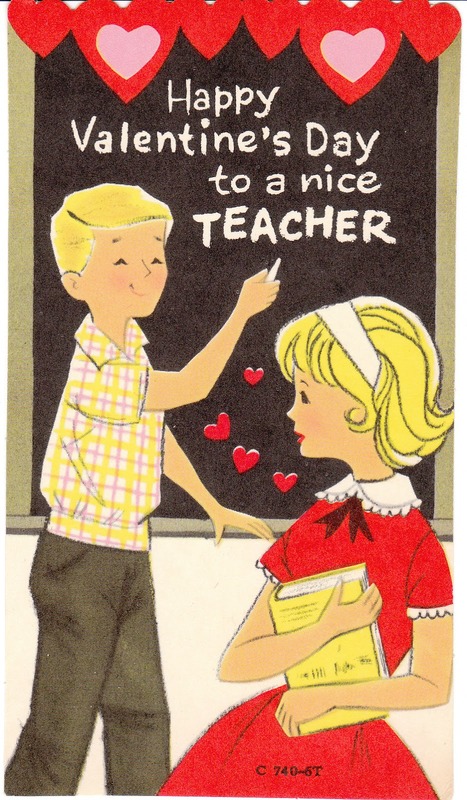 Two baby boomer vintage children write on a chalkboard for their teacher - a very cute card! An old fashioned classroom - also for teacher. These cards, along with more school and teacher themed Valentines, can be found at Birdhouse Bookss.